An analysis of the recent strike-wave in Egypt which involved tens of thousands of textile workers and a look at the history of labour militancy in the country. For the last ten years Muhammad ‘Attar, 36, has worked in the finishing department at the gigantic Misr Spinning and Weaving Company complex at Mahalla al-Kubra in the middle of the Nile Delta. He takes home a basic wage of about $30. With profit sharing and incentives, his net pay is about $75 a month. His 33-year-old wife, Nasra ‘Abd al-Maqsoud al-Suwaydi, makes about $70 a month working in the ready-made clothing division of the same firm. These wages are barely adequate to feed, house, clothe and pay for obligatory after-school private lessons for their three sons: Magdi (age 12), ‘Umar (age 10) and ‘Ali (age 5). The ‘Attar family income is nearly double the absolute poverty line of $975 a year for a family of five in an urban zone of the Nile Delta, but well below both the upper and lower international poverty lines set by the World Bank. Sayyid Habib began working at the Misr Spinning and Weaving Company in 1964, when he was 18. After 44 years of service, he earns a basic wage of about $40 a month plus profit sharing and incentives. Workers like ‘Attar and Habib tolerate such low wages because the Misr firm is part of Egypt’s large public sector. Manual workers and white-collar employees in the public sector have jobs for life and the right to a pension equal to 80 percent of their salary at retirement. Since 2004, however, the Egyptian government has renewed its drive to privatize the textile industry. Workers fear that the new investors, many of them from India, will not provide them with the job security or the benefits they and other public-sector workers have enjoyed since most textile mills, along with other large and medium-sized enterprises in all sectors of the economy, were nationalized in the early 1960s under Gamal Abdel Nasser. These fears have led to an unprecedented wave of wildcat strikes, which, since late 2004, have been centered in the textile sector, but have spread to other industries as well. In late 2006 and 2007, the strike wave has reached a particularly high crest. Muhammad ‘Attar and Sayyid Habib were among the leaders of a December 2006 strike at Misr Spinning and Weaving, one of the most militant and politically significant in the current strike wave. This upsurge of labor collective action has occurred amidst the broader political ferment that began in December 2004 with taboo-breaking demonstrations targeting President Husni Mubarak personally, demanding that he not run for reelection in 2005 (he did) and that his son, Gamal, not succeed him as president. An amendment to the constitution permitting the first-ever multi-candidate presidential election generated expectations that the 2005 presidential and parliamentary elections would be fair and democratic. These hopes were frustrated. Nonetheless, a wide swathe of the public, which is mostly engrossed in trying to earn a living, began to take notice of politics. With the election of 88 Muslim Brothers in 2005, Egypt’s normally sleepy Parliament acquired a substantial opposition bloc that has exerted continual pressure on the regime. Inexperienced in handling serious public debate, the regime has begun to crack down viciously on all manner of dissenters -- from Muslim Brothers to bloggers and journalists. The passage of a second round of constitutional amendments in March 2007 will make it much more difficult for independents and Muslim Brothers to run for political office and permanently allow abusive police practices that have been nominally illegal or permissible only under the “temporary” state of emergency in force since 1981. Even before the regime’s crackdown, there was a marked decline in the activity of the well-known Kifaya movement and other extra-parliamentary forms of opposition. But the wave of strikes and other forms of working-class collective action continues unabated. It represents the most substantial and broad-based kind of resistance to the regime -- one that must be handled very delicately if Husni Mubarak hopes to maintain the “stability” he needs to pass the presidency on to his son, as most Egyptians are convinced he seeks to do. The 24,000 workers at Mahalla al-Kubra’s Misr Spinning and Weaving complex were thrilled to receive news on March 3, 2006 that Prime Minister Ahmad Nazif had decreed an increase in the annual bonus given to all public-sector manufacturing workers, from a constant 100 Egyptian pounds ($17) to a two-month salary bonus. The last time annual bonuses were raised was in 1984 -- from 75 to 100 pounds. A fighting spirit was in the air. Over the following two days, groups of workers refused to accept their salaries in protest. Then, on December 7, thousands of workers from the morning shift started assembling in Mahalla’s Tal‘at Harb Square, facing the entrance to the mill. The pace of factory work was already slowing, but production ground to a halt when around 3,000 female garment workers left their stations, and marched over to the spinning and weaving sections, where their male colleagues had not yet stopped their machines. The female workers stormed in chanting: “Where are the men? Here are the women!” Ashamed, the men joined the strike. By then, police had cut off water and power to the mill. State agents scurried to the train stations to tell workers coming from out of town that the factory had been closed down due to an electrical malfunction. The ruse failed. “More than 20,000 workers showed up,” said ‘Attar. “We had a massive demonstration, and staged mock funerals for our bosses. The women brought us food and cigarettes and joined the march. Security did not dare to step in. Elementary school pupils and students from the nearby high schools took to the streets in support of the strikers.” On the fourth day of the mill occupation, panicking government officials offered a 45-day bonus and gave assurances the company would not be privatized. The strike was suspended, with the government-controlled trade union federation humiliated by the success of the Misr Spinning and Weaving workers’ unauthorized action. Soon thereafter, activists like ‘Attar and Habib wound up to deliver what could be the biggest blow of all to the federation. The strike leaders launched a campaign to impeach local union officials, who had opposed the strike and who, according to activists, enjoy close ties with the security services. By the end of January, around 12,800 workers had signed a petition addressed to the General Union of Textile Workers, demanding impeachment of the Mahalla local union committee and the holding of new elections. The Misr workers gave the General Union a February 15 deadline, by which they would need to sack the local union officials or face mass resignations from the General Federation, the workers’ first step toward building an independent labor union. Federation bosses adamantly opposed the impeachment demand, fearing it would trigger a flurry of similar initiatives elsewhere. Instead, General Union negotiators floated the idea of a “Representatives’ Committee” to work side by side with the committee the workers were trying to impeach. This Representatives’ Committee would include about 105 workers, elected straight from the shop floor. A worker activist who attended the meeting said that Federation representatives implied that the old committee would be “marginalized” and that the Representatives’ Committee would eventually have “more say in how things are run in the mill.” The General Union refused to put anything on paper, however. The workers, ‘Attar said, got the feeling that “the representatives would be janitors for the union officials. Since these talks broke down, workers have been mailing their resignations to the General Union of Textile Workers on a daily basis, said ‘Attar and Habib. By early March, the two activists estimated, 6,000 resignations had been dispatched. A worker-management showdown is expected by the end of March, because then the union should stop deducting the workers’ membership dues automatically from salaries. The workers do not expect their resignations to be honored. The outcome of this battle, which could drag on for months, may well determine the course of the labor movement in the years to come. The victory achieved by the Mahalla strikers has already reverberated throughout the textile sector. 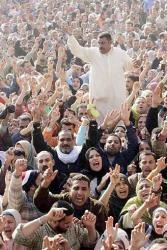 In the three months following the December 2006 strike, about 30,000 workers in more than ten textile mills in the Nile Delta and Alexandria participated in protests ranging from strikes and slowdowns to threats of collective action if they did not get what the Mahalla strikers won. In virtually all cases, the government succumbed. As in Mahalla al-Kubra, riot police were deployed around the mills, besieging the compounds, but in no case did they make good on threats to break the strikes by force. In most cases, local union officials opposed the strikes, and attempted to abort them. At the Misr mills in Kafr al-Dawwar, the strikers “detained” union officials inside the factory to compel them to join the strike. While hostility toward the union bureaucracy prevails everywhere, only the strikers of Kafr al-Dawwar and the Shibin al-Kum Spinning Company have pressed the Mahalla demand to impeach local union officials. There was talk of this demand in other locations, but so far it has not materialized. In one case, the workers dropped the demand following the end of the strike; in another, they filed a lawsuit. But there has been no mobilization on the ground to support such legal action. The Misr Spinning and Weaving strike has also found echoes in workers’ struggles outside the textile sector, though there has been no active coordination. In December, cement factories in Helwan and Tura went on strike. At the same time, auto workers in Mahalla al-Kubra staged a strike and sit-in. In January, railway engineers went on strike, blocking the first-class Turbini train from Cairo to Alexandria that primarily transports businessmen and professionals. They later threatened a national work stoppage, until the government agreed to most of their demands and promised to acquiesce in more. During the railway strike, the Cairo subway drivers slowed the speed of their trains from 55 to 20 miles per hour in solidarity. Railway strikers spoke of how “encouraged they were by the victory at Mahalla.” There were also wildcat strikes by truck and microbus drivers, poultry farmers, garbage collectors, and public gardeners and sanitation workers. The Misr Spinning and Weaving Company in Mahalla al-Kubra has a long history of working-class militancy dating back to the 1930s, including a ferocious strike in September-October 1947 demanding an independent trade union. Workers’ victories won there have often sent ripples far beyond Mahalla. Since it was established in 1927, the Misr mill has been considered a cornerstone of Egypt’s industrialization effort. It has recruited generations of peasants from the surrounding villages, and transformed them into “modern” workers as they turned Egypt’s principal agricultural product, cotton, into finished cloth. It is no accident that the Misr conglomerate, of which the Spinning and Weaving mill was the flagship enterprise, was the first industrial firm to be nationalized by the regime of Gamal Abdel Nasser in 1960 as it began to embrace “Arab socialism.” Some of the current strikers draw upon an activist heritage in their own families. In the year Misr Spinning and Weaving opened its doors, Sayyid Habib’s father came from the village of Tala to work in the dyeing department shortly after he was married. His initial monthly wage was 90 piasters (a piaster is a hundredth of a pound). In 1975 he retired with a pension of ten pounds and 80 piasters a month. After the mill was nationalized, pensions were made subject to a cost-of-living increase, so his final monthly pension when he passed away in 1996 was 182 pounds. Habib’s father would regale his little son with stories of the workers’ battles of yesteryear. “He did a good job,” said ‘Attar with a wink. “Work conditions [when I started] were better than today,” Sayyid Habib said. “I used to get 2.05 pounds a month for an eight-hour day. The workers supported the nationalization. It raised salaries, and social insurance was granted. Another achievement of the nationalization was setting up a workers’ cafeteria. Breakfast back then cost one piaster, [which got you] a cup of tea, a dish of beans, salad and a round of bread. Lunch, consisting of two pieces of beef or a quarter of a chicken, rice, vegetables and fruit, cost two piasters.” In the mid-1960s, recalled Habib with a smile, “For 20 piasters a day, my mother used to go to the market and buy everything we needed in the house.” The workers’ cafeteria was closed down in 1994, Habib said. ‘Attar added bitterly that it was “still open, but only for the elite” -- managers and their favorites. By the late 1960s, wages began to lag behind the cost of living. This trend was exacerbated after 1970, when President Anwar al-Sadat succeeded Nasser, as resources were directed toward the military in preparation for the 1973 war. Nonetheless, Habib felt that “when Sadat announced the ‘open door’ economic policy [in 1974], things were moving forward. The company had 184 clients internationally. Raw materials and labor were cheap. There were around 40,000 workers in the mill.” In response to declining real wages, in 1975 Habib participated in a three-day sit-in strike that resulted in a wage increase from nine to 15 pounds a day for all public-sector production workers in Egypt. In October 1985, Habib was arrested and detained for 12 days for planning a strike to demand increased work uniform allowances and incentive pay. Two and a half months later, he participated in a strike that won a paid weekly holiday and double-time pay for working on Friday. This, too, was applied to all public-sector workers. Workers’ collective memory of better wages and working conditions has continued to fuel labor activism as the Mubarak regime steadily chips away at the social compact established under Nasser. Since the mid-1980s, the structural crisis of Egypt’s textile industry has intensified, as wages and working conditions have deteriorated. The proportion of textile workers in the industrial work force began declining in 1960; the absolute number of textile workers began declining in 1976. The index of real wages of textile workers declined from 100 in 1986 to 61 in 1994, an even more precipitous decline than that of the industrial work force as a whole. Due to lack of capital investment, productivity in the Egyptian textile industry was actually lower in 1999 than in 1985. It is now much lower than in neighboring countries like Tunisia and Turkey. A quarter of the machinery is outdated and needs to be renovated or replaced. The 1991 Gulf war created the conditions for Egypt to sign a “structural adjustment” agreement with the International Monetary Fund and the World Bank. This deal opened the way toward privatizing the public sector, a step that the international financial institutions had been urging upon Egypt for over a decade. After resisting privatization since 1974, the leadership of the General Federation of Egyptian Trade Unions endorsed it. Several state-owned textile firms were sold to Egyptian and foreign investors during the mid-1990s, generating 12 percent of all proceeds from the sale of public-sector enterprises. >From 1992 to 2000, the market share of the private sector in cotton spinning grew from 8 percent to 58 percent. Privatization has not improved the lot of textile workers. Wages of Egyptian textile workers are among the lowest in the world: 85 percent of wages in Pakistan and 60 percent of wages in India. A weaver in a well-run private-sector enterprise makes about 1,000 pounds a month; a spinner makes about 800. The lower-paid spinners are mostly women. These wages are roughly double what workers earn in the same jobs in the public sector, but private-sector textile workers work 12 hour shifts (as opposed to eight in the public sector) and rarely receive the health insurance or other social benefits to which they are legally entitled. By 1999, 137 of the 314 public-sector firms declared eligible in 1991 had been privatized. Although 1991 legislation forbade mass layoffs after privatization of a firm, managers of public-sector firms under consideration for privatization often attempted to make them more attractive by reducing the work force before the sale. Anxieties about unemployment and other possible consequences of privatization prompted a renewal of strikes and collective action in the mid-1990s, with major strikes at Misr Fine Spinning and Weaving in Kafr al-Dawwar in November 1994 and Misr Helwan Spinning and Weaving in August 1998. At the Misr Helwan mill, the entire work force of 8,700 was given a three-week vacation. Then management announced that only 2,800 workers should return to work. Rumors spread that the enterprise would be leased to a private investor. At the beginning of the current strike wave, some 400 mill workers in Qalyoub sat in at their enterprise from February to June 2005 protesting the sale of their firm to a private investor, because neither the government nor the new owner would guarantee the level of their wages, benefits and pensions. Few private-sector firms are unionized. There have been attempts to organize the workers at two private-sector textile companies in Mahalla. A union was established at the Samuli Company (3,500 workers) in 2003. The owner initially agreed to negotiate with the union. But after several confrontations, he sacked 18 workers, including the three elected union representatives. At the Abu al-Siba‘i firm (1,500 workers), the owner managed to buy off the three new union officials with payments of 20,000 pounds each, and the project failed. Despite the low wages and greater “flexibility” for managers at privatized firms, the Egyptian textile industry remains uncompetitive on the world market. Exports began to decline in 1990, exacerbated by a global textile recession in 1991. Due to lack of investment, public or private, in 2001 the value of total production reached the lowest point since government statistics began to be collected in 1996-1997. The Mahalla workers, along with thousands of others, seized the opportunity of the political opening created by the anti-Mubarak demonstrations of 2004-2005 to press their demands. Despite its commitment to privatization, the Mubarak regime cannot afford to alienate such a large and strategically important stratum of the population. Absolute poverty is defined as inadequate income to provide the food, shelter and clothing needed to preserve health. The figure given here is specific to Egypt. The World Bank uses international poverty reference lines set at $1.08 and $2.15 in 1993 Purchasing Power Parity terms. This would mean $1,971 and $3,924 for the ‘Attar family. The authors interviewed Muhammad ‘Attar and Sayyid Habib in Mahalla al-Kubra on March 9, 2007, and are deeply grateful for their willingness to share their experiences and insights. Al-Masri al-Yawm, February 10, 2007. See Joel Beinin and Zachary Lockman, Workers on the Nile: Nationalism, Communism, Islam and the Egyptian Working Class, 1882-1954 (Cairo: American University in Cairo Press, 1998). Tamer Abdel-Kader, “State, Capital and Workers’ Protests in Egypt” (unpublished master’s thesis, American University in Cairo, 1998), p. 79. American Chamber of Commerce in Egypt, The Textile and Clothing Industry in Egypt (Cairo, August 2004), p. 70. Jolynn Khamky, “Liberalization to Divestment: Egypt, 1960-2000” (unpublished senior honors thesis, Department of History, Stanford University, 2003), pp. 50, 65. Interview with the owner of a private-sector textile enterprise who wishes to remain anonymous, Cairo, March 19, 2005. Agnieszka Paczynska, “Globalization and Pressure to Conform: Contesting Labor Law Reform in Egypt,” paper presented at the DC Area Workshop on Contentious Politics, University of Maryland, October 23, 2002. Abdel-Kader, p. 81; Egypt, Central Agency for Public Mobilization and Statistics, On-Line Census of Industrial Production, 2000-2001.